Over the years, I have visited many gardens but few have made such an impression on me that I want to return over and over again to see what new creative designs and tweaks have been implemented. I have nothing but admiration for the Chanticleer staff. This is not a new book – it was published in 2015 – but I am only now finding the time to read it. 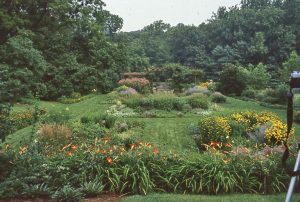 Once a private estate, Chanticleer is a pleasure garden, a gardener’s garden. It is romantic and imaginative yet contemporary. It is unique. I would say that the foremost principle of Chanticleer is the notion that art and gardening are inextricably intertwined. The talented staff take their ideas and flesh them out in various media; they find beauty everywhere and then present it to visitors. The garden, that changes constantly, is not just about plants. It’s also about creating an experiential journey that includes scent, color, sight, sound, and texture. Similar to residential gardens, Chanticleer is divided into a series of garden rooms, making the ideas in each easily translatable to home gardens. 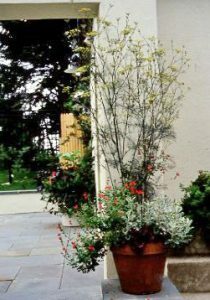 Each of the gardens has a microclimate and a focus that designers and homeowners look for: low-maintenance, xeriscape design, perennial plantings with differing levels of maintenance, high water levels, shade, native plants, container combinations, to mention a few. We are reminded that gardens should be designed with views from the house windows in mind as well as views while walking through the gardens. We are also reminded that repeating patterns and plants helps to unify a series of garden rooms. The gardeners at Chanticleer are very lucky; they have the ability to let their gardens evolve whereas most landscape designers create a design for their clients and never see it again. That evolution means constantly refining and tweaking the design as plants mature or changes are made by nature. In addition, it involves editing so that plants that reseed freely do not overtake the site. A different kind of evolution is called transitioning at Chanticleer. This is a design method that avoids empty spaces. For instance, many spring-blooming bulbs are planted but we know that they claim attention for only a short period of time. 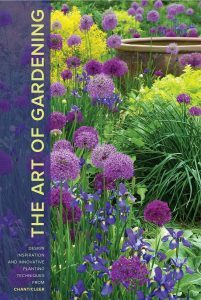 Thus, the Chanticleer gardeners interplant other spring-blooming perennials or perennials with interesting foliage that will fill the spaces left by dying bulbs. Later those spaces will be filled with striking annuals. I love the fact the Chanticleer gardeners look at the functionality of plants: how they contribute structure, define spaces, provide screening, provide color through their foliage, twigs, and bark as well as their flowers, texture, soften hardscape structures, and provide places for the eye to rest. One of the foremost photographers of our day is Rob Cardillo and his photos make this book even better because each is a work of art. As an experienced gardener, I know how many failures I’ve had. In the introduction, Bill Thomas, the former director of Chanticleer, stresses the importance of trying again and again and then of moving on to something else. His words are inspiring and so are those of the staff members who contributed to this wonderful book. If you are looking for inspiration, read this book; you won’t be disappointed.